Vocoder 5000 is the best-sounding software vocoder around, but it's a real CPU guzzler and takes a while to learn. Not for the faint-hearted! Flexible filter bank routing. The best software vocoder we've heard! Loads of useful, creative parameters. Handy built-in synth. High CPU usage. Terrible manual Interface fiddly in places. 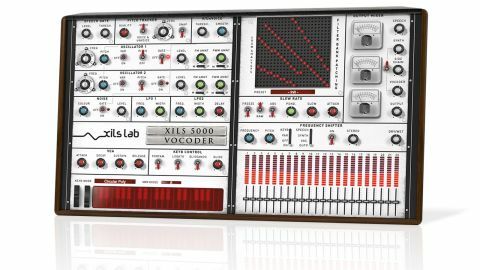 Things have been a little quiet on the vocoding front of late, so fans of weird and wonderful vocal effects will no doubt be keen to try out XILS-lab's latest, an emulation of the classic EMS Model 5000 vocoder from 1976. Like all vocoders, Vocoder 5000 (VST/AU/ RTAS/AAX) works by splitting a modulator input (eg, a vocal) into a number of bands using an array of band-pass filters, the levels of which are analysed by envelope followers. "It's the best software vocoder we've ever heard - it's clean, crisp and defined"
This information is used to control the levels of a matching array of band-pass filters applied to a carrier signal (eg, a synth), resulting in a signal that combines the timbre and pitch of the carrier with the articulation of the modulator (the vocal) - in the case of our example, the classic 'robotic' voice. The last Model 5000 emulation we saw was the now-discontinued ELS Vocoder (originally released by Eliosound), which XILS-lab's DSP genius Xavier Oudin also worked on. That plugin generated its own carrier signals via a built-in two-oscillator synth, but was incapable of accepting an external carrier input. This was one of our major criticisms of it, and thankfully, Vocoder 5000 - which is an all-new, freshly coded plugin and not a 'repackaging' of the ELS Vocoder - has no such limitation thanks to its sidechain input, which allows any audio source to be used as the carrier in addition to the effect's built-in two-oscillator polyphonic synth. The majority of the Model 5000-based parameters sit on the right-hand side of the interface, with the synth controls and a few modulator panels on the left. It's still not the most intuitive setup, though, and matters are made worse by the dreadful manual (badly written, inconsistent with the product, and doing a poor job of explaining the plugin's functionality), and the fact that many of the most important settings are hidden behind small, pale, hard-to-spot "advanced" buttons. Thankfully, once you've got to grips with the dire documentation and unhelpful interface, it quickly becomes clear that Vocoder 5000 has it where it counts: the sound. We'd go as far as to say it's the best software vocoder we've ever heard - it's clean, crisp and defined, and sure to bring a warm glow to the heart of anyone interested in the more psychedelic side of sound design. The wealth of controls make it possible to transform sounds in awesome ways, particularly the Filter Bank Patching panel - see Patch of the day. As well as the plugin's ability to use an external carrier source, Vocoder 5000 is superior to ELS Vocoder in two key areas: it includes a decent amount of patches, and the number of bands can be changed (admittedly the only options are 20 or 22 bands, but that at least gives the user the choice of 'lo-fi' and 'hi-fi' modes). On the downside, the CPU usage is incredibly high, even on top-spec machines, so we'd recommend making sure the demo performs adequately on your system before hitting that 'buy' button.